The problem with being on holiday in springtime is that I am thinking about the garden the whole time – if you didn’t know it by now I am telling you, gardeners are obsessive! I don’t know if you have noticed but gardeners never sit in their gardens – they are always doing something. No sooner do I sit down with a cup of tea and the paper and I am up; pulling out that weed, marvelling at something that has just begun to flower, harvesting beans that need picking and pulling off caterpillars. In fact, that was the first thing I did when I returned from my holiday to Malaysia – walked out into the garden and did a health inspection, because, after all – early intervention often saves a whole crop of food. The rest of the garden can wait; dead-heading flowers, pruning shrubs, weeding, mulching, mowing – unimportant compared with my food plants. Mostly everything looked pretty healthy apart from these! 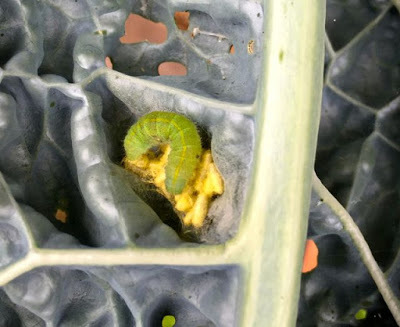 WHAT: I only had to look at my kale plants to see that they were being devastated by the caterpillar of the cabbage white butterfly. Tell-tale holes, munching of the new growth, and it didn’t take long before I spotted those well-fed green culprits camouflaged along the mid-rib of the leaves. Look for clumps of eggs on the underside of the leaves. 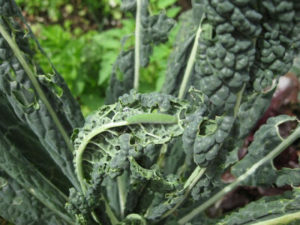 These were on my kale plants and are already hatching out into the damaging caterpillar stage – easy to pick off. WHO: The adult cabbage white butterfly (c.w.b.) is a small creamy/white butterfly with two black spots on it’s wings and it is only interested in plants in the brassica(cabbage) family. 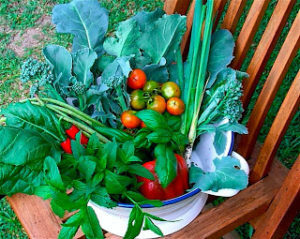 This is where an understanding of vegetable families and companion planting is going to make you a better gardener. Understanding how your garden works is a lot about observation. Follow a c.w.b. around the garden and see that it has to land three times on a brassica plant before it settles and starts to lay it’s eggs. If it is confused by other plants of a different smell, size, shape, flower – it will head off somewhere else – this is what companion planting is all about. 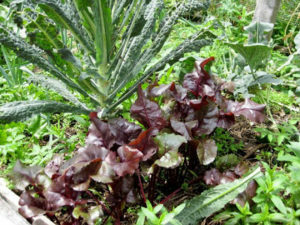 What do you notice about the beetroot leaves in the above photo – not one munch hole – that is because beetroot is in a different family (chenopidaceae) – it is not a brassica so the c.w.b. will leave it alone. In fact most of the plants in this family are pretty pest free – this is a good reason to interplant them among your brassicas – it helps confuse the c.w.b., assists with passive crop rotation (they take different things out of the soil) and means that you always have something to eat. Let’s start with these two families and watch the whole companion planting story unfold from here! CHENOPIDACEAE: beetroot, spinach, silver beet, chard, sorrel, amaranth, quinoa. Being cabbages. 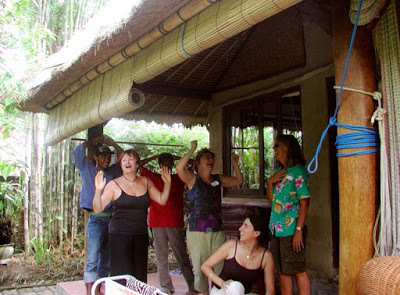 Students at a workshop in Bali role playing the cabbage white butterfly and companion planting story. Who said gardening was boring? Try fooling the butterfly by placing pieces of eggshell around the garden (the theory is that they will think that there is already a butterfly there and fly off). Interplant with lots of strong smelling herbs like basil, fennel, parsley, dill and tall flowers like cosmos, zinnia and marigolds – this creates confusion to the c.w.b. When they flower they have the added benefit of encouraging beneficial insects that wants to do a lot of the work for you. Do this first – don’t reach for the spray can because you will be killing off the goodies too! Make your garden a safe haven for their natural predators – birds and lizards – and don’t keep domestic pets that will scare them off. I have an opportunist magpie that follows me around the garden waiting for me to pick off any caterpillars I find. Provide areas of ground-hugging shrubbery and lots of shallow bird baths to encourage them. Last resort-spray with Dipel. This is a bacillus that only affects the gut of caterpillars and is safe to use for organic gardeners. MOST GARDEN PEST CONTROL IS UNNECESSARY – some cause more problems than they solve – be patient – let’s grow things, not kill them. Holiday reading – gardening magazines! Gardeners are never off-duty. That's great I am certainly going to implement your ideas! Tomato dust usually refers to the fungicide made up of sulfur and copper oxychloride so will not control eggs of the CWB – it's purpose is to control fungal disease. Either remove the eggs by hand, hose off or use Dipel. You don't want to be eating food that you have treated with chemicals. I notice cwb eggs on my kale leaves. I sprinkled with tomato dust. Did I do the correct thing? what should I do now? I was doing some maintenance work in the garden when I noticed a pretty white butterfly around the broccoli. After it had flown away I went in for a closer inspection. I looked on the underside of the leaves and sure enough found what looked like eggs. I picked of the eggs and inspected the rest of the plants. There were eggs on just about all of them. I was thinking a good protection for them was to cut out the bottom of a used coke bottle and placing that over the plants. Ok while they're young but the bottle wouldn't be large enough when they're fully grown. It would also protect them from root fly I think? Thank you – it's like solving the clues to a crossword puzzle, one by one. It's fantastic that there is always something knew to learn – I know I do. This is GREAT information, THANK YOU! !